The painter of the Italian Renaissance, Andrea Mantegna, painted original canvases that differed from the classical works of the era in a sharp and tough manner. “The Dead Christ” – a mournful picture depicting the gospel plot of mourning for the crucified Jesus, was written simply and easily. But the perspective here is noticeably transformed. And the very way of presenting the dead Son of God to us is strikingly different from similar pictures by other artists. Mantegna was the first to place the body of Christ on canvas with his feet to the audience. In this case, the legs seem disproportionately small in comparison with his head. In this way, the painter presented the law of perspective not as a callous demanding requirement, but as a plastic quantity serving the ideas of a particular composition and obeying the wishes of the artist. Mantegna wanted to focus on the head of the Savior, so he wrote it larger. The expression on the face of Jesus is the compositional center: it seems that the face is not dead, but immersed in a deep sleep. Allegorically expressed belief in the resurrection. The sobbing faces of John and Mary are very crudely written: they are wrinkled, crouched with sorrow. 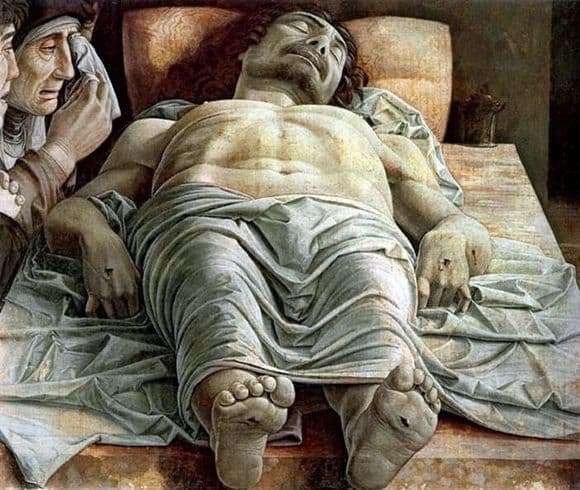 The tragedy is amazingly transmitted: looking at the picture “The Dead Christ” physically feels a lump in the throat and a pressing pain in the soul. A lot of attention was paid to the artist drawing the folds of the white sheet covering the body. The whole color palette of the picture differs restrained asceticism. The body of Christ is full of grandeur; the stigmata on His limbs look frighteningly realistic. The atmosphere of the mourning canvas, but anticipating a speedy divine miracle. Historians believe that the “Dead Christ” in the gallery of Milan is one of the many author’s copies, and the original has been lost. During his lifetime, the artist greatly valued this very work, keeping it at home.